My Creative Existence: Happy Valentine's Day! Valentine's Day is not usually a day that my husband and I go crazy over any more - but we usually give each other a card to show how much we care. I went with a simple colour combo - red, black, and kraft, with a touch of pewter - and came up with 2 cards - one quite simple and a little girly, and one more edgy and masculine. I inked up the wildflower stamp (from the Darkroom Door Wildflowers Vol 2 stamp set) with black ink, and then used a baby wipe to remove the ink from the flowers, leaving just the stems and leaves with ink. I then stamped it onto the Kraft cardstock. 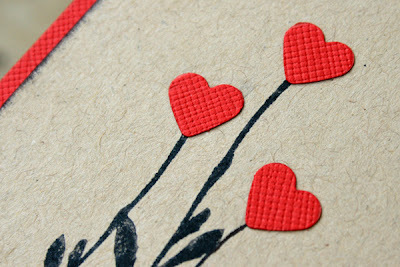 I punched 3 hearts out of bazzill cardstock, and glued them to the top of the stems. I stamped "Happy Valentine's Day" (from the All Occasions stamp set) with TH Embossing Ink and embossed it with Pewter embossing powder. I inked around the edge of the kraft cardstock with black ink and adhered it to a red bazzill cardstock base. First I stamped the Criss Cross background stamp onto the Kraft cardstock with embossing ink, and embossed with Pewter embossing powder. I then inked around the edge with black ink. 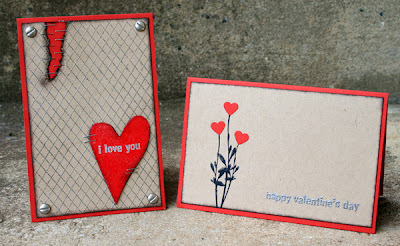 I then cut a heart out of chipboard (I used a grungeboard negative shape as a template) and inked it all over with embossing ink and embossed with red embossing powder. 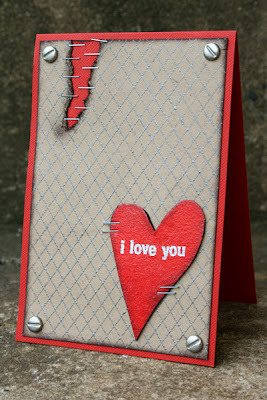 While it was still hot, I stamped "I Love You" over the top of it with silver ink. I then inked around the edges with black ink. I glued the heart to the bottom right hand corner of the background, and added some staples to the sides. I tore out a piece of the background at the top left hand corner, inked the edges with black ink, and adhered a piece of red cardstock behind the tear. 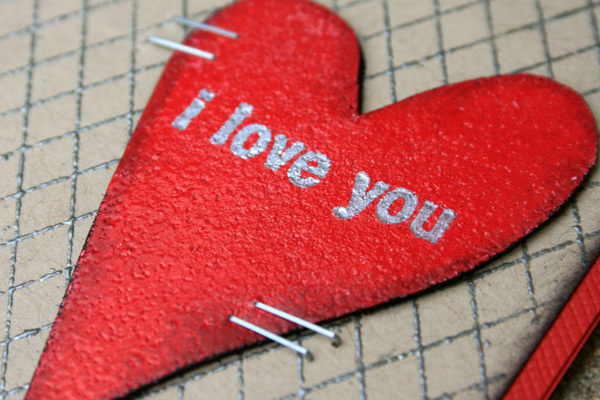 I then added staples to each side of the tear. Lastly, I added some screw brads to the corners, and adhered the background to the red bazzill base card. This is the one I ended up giving to my hubby and he loved it! The base is black bazzill cardstock. 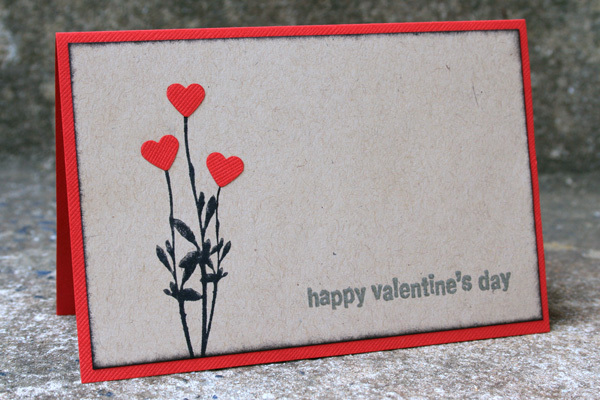 The background is kraft cardstock. I stamped the Darkroom Door Criss Cross Background Stamp onto the bottom with Barn Door Distress Ink, and then ruled a black line above it with a Sharpie. 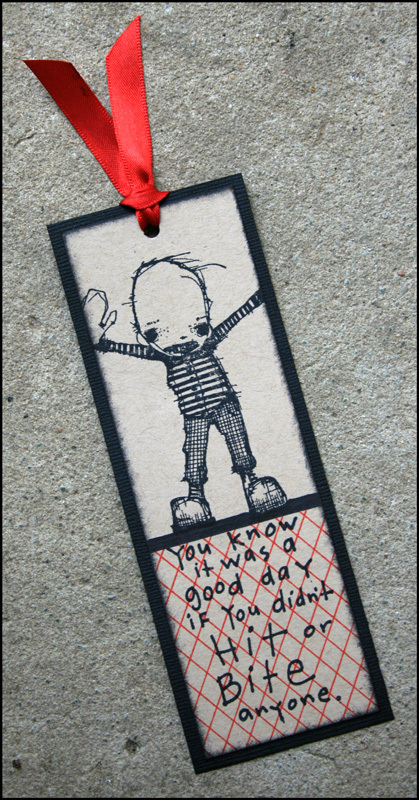 I then stamped that spooky little guy (from Stampotique) at the top of the bookmark, and the quote over the criss cross background, both in black ink. I inked around the edges with black before adhering it to the black bazzill base. I punched a hole through the top with my Cropadile, and threaded some red satin ribbon through to finish. Great cards and bookmark Sarah :-) Love the metal elements. These are great projects! I love the bold, graphic nature, and all the texture and interest you've created. Beautiful! LOL Michelle - noooo!! He bought me a really nice card. I'll just keep that one in my stash if anyone ever needs one!